Quite the creepy diminutive sub genre this neo folk. The main reason for its forbidden status seems to lie in one of its best known progenitors, DEATH IN JUNE, who used, and whose fans often embraced, Nazi imagery and paraphernalia. FORSETI presents as a more docile relative, but Andreas Ritter does seem obsessed with the old fashioned, an ideal embraced by hippies and fascists alike, for their own ends. What of the music? This inaugural full length CD is largely dominated by Ritter's downcast vocals, acoustic guitar, accordion and strings, including cello, and even woodwinds, with the sinister martial aspects of neo folk occasionally rounding out the arrangements. 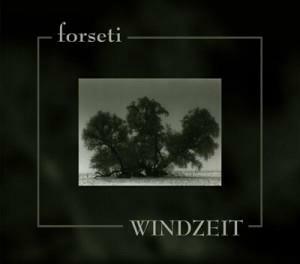 These aspects slot FORSETI closer in timber to STRAWBS circa "Dragonfly", OUGENWEIDE, early 1980s NOVALIS, and even PERERIN, than to the post punk industrialism of their neo folk brethren. Unfortunately, Ritter's insufficiently medicated moribundity, consummately executed for a couple of tracks, dissolves into tedium too soon. It begs repeated listens but does not compensate for them. Probably the most fully realized tracks are the opener and the very PERERIN like "Herbstabend", although you might pick two others, my point being that this is all well crafted and sincere sounding, but lacking in dynamics. 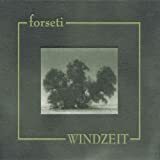 Post a review of FORSETI "Windzeit"